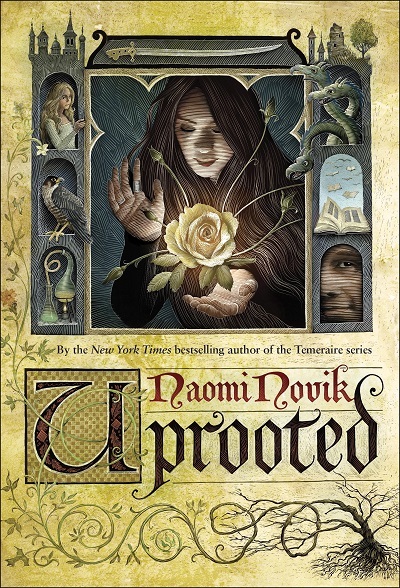 Uprooted is the latest novel by Naomi Novik, whose writing has received much recognition. 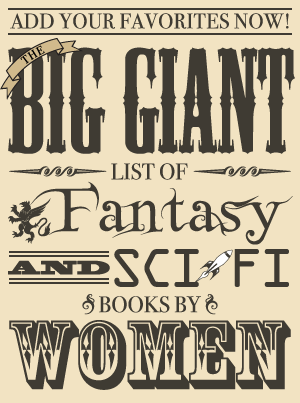 She is a recipient of the John W. Campbell Award for Best New Writer, and multiple books in her Temeraire series have been New York Times bestsellers. The first novel in this series and her debut, His Majesty’s Dragon, won both the Compton Crook Award for Best First Novel and the Locus Award for Best First Novel and was nominated for a Hugo Award in the Best Novel category. Despite the amount of praise I’ve seen for her work, I hadn’t read any of her books until reading Uprooted—and I now know I must remedy this because this stand alone fantasy is one of the most compelling books I’ve read in a long time! Every ten years, the wizard known as the Dragon chooses a seventeen-year-old girl to live in his tower. She stays with him until the next choosing and leaves with a significant dowry once a decade has passed—but she never seems to be the same person she was before her time with the Dragon. All the girls taken by the Dragon choose to leave their former home behind once they are free; Agnieszka’s father says it’s like they forget how to live there and realize they should be afraid of living near the Wood that the Dragon protects them from. Although Agnieszka is the right age to potentially be whisked away by the Dragon, neither she nor her family is concerned that he will choose her—everyone has known for years that her dearest friend Kasia will be the one chosen. The wizard always selects the girls who are special in some way, and Kasia is so beautiful, clever, and brave that Agnieszka imagines the girls in the stories she’s told as being at least somewhat like her friend. When the fateful day arrives, the Dragon does indeed look satisfied with Kasia, but he does not choose her in the end: it is Agnieszka he decides to take. Agnieszka can’t figure out why the Dragon chose her instead of Kasia at first. She’s constantly getting food or mud on her clothes, she can’t cook particularly well, and her mere presence seems to irritate the wizard. She’s comforted to find messages from a previous girl indicating that she has nothing to fear from the Dragon, but she soon realizes he is treating her differently than the others: he is teaching her magic, and he chose her because one with magical ability must be taught. In this, Agnieszka also seems incapable of pleasing him as she finds the simplest cantrips difficult. Despite her early appearance of ineptitude, Agnieszka proves to be quite powerful when she follows her own instincts instead of relying on his teaching—and she may be uniquely suited to help him protect others from the Wood. Uprooted was absorbing from its first paragraph, but it’s not one of those books that faded after a strong opening—it managed to keep me captivated until the very end. It’s a delightfully-narrated fairy tale with magic both wondrous and dangerous, although it’s not what I’d call a grim book despite the terrors of the Wood. Most of all, I enjoyed reading about Agnieszka—a brave, persistent, goodhearted young woman—and her journey. In some ways, Uprooted is predictable but it is also unconventional. Since I expected it from the start, I don’t think it’s a spoiler to say that there is a romance. Agnieszka has to leave her family to live with a wizard who doesn’t seem to like her very much, and romantic tension develops as the two learn to work together. I loved every single scene between her and the irritable Dragon and wouldn’t have wanted it any other way, but I was surprised that it wasn’t the main focus of the story or even the most prominent relationship. After Agnieszka left her home and Kasia behind, I figured Kasia would only be occasionally mentioned from that point forward and was pleased Kasia was an important character with her own heroic moments. Their friendship and the lengths Agnieszka go to for her friend drive much of the story since helping Kasia causes Agnieszka to gain a greater mastery of her magic in the first place—and much of what happens after is due to the news of what she discovers and her desire to protect her dearest friend. While the friendship was important, the main driving force in Uprooted is Agnieszka herself. She is the catalyst for events and change, not just because she is a powerful witch but also because of who she is. In the beginning of the story, Agnieszka feels that she is not brave when compared to Kasia, whose voice does not waver when she speaks to the Dragon even though she’s convinced he will take her away from her home. Agnieszka’s unable to do anything right, including cooking and simple magic. It is perhaps a little convenient that magic comes to her as easily as it does once she discovers that she’s struggling because her magic is not like the Dragon’s, but she also has to work for it with study and experimentation in spite of being unusually gifted. Many would give up when faced with the same challenges, especially after being told what she wants to do is impossible, but Agnieszka does not. When she has a goal, she does her best to achieve it. She’s successful not just because of her power but because she’s persistent and willing to think about—and do—things differently. Agnieszka is amazing and so much stronger and braver than she gives herself credit for being. At first, some of her courage does seem to be due to ignorance, though by the end I’m quite certain she’s aware of the risks that come with her decisions. Even though she’s heard the stories of people being taken by walkers and disappearing into the Wood forever—or worse, people who do return and seem fine until those around them begins hurting themselves—and remembers what happened to those who ate plants tainted by pollen from the Wood, it’s not exactly the same as seeing the depth of this corruption firsthand. The Wood is seriously creepy, and while the book does not tend to be overly dark or grisly, dealing with the Wood does come with a price. My only criticism of Uprooted is minor. I did feel that the second half was not quite as riveting as the first, although it was still excellent and difficult to put down. More actually happened in the second half, but I loved learning about the setting and Agnieszka’s discovery of her magic (plus there were fewer scenes with the Dragon in the latter part of the book and I did miss seeing her interact with him). Uprooted is a lovely book and is currently my favorite book of 2015 (and a new favorite book period!). I loved everything about it—the magic, the creepy Wood, the Dragon, Kasia, and especially Agnieszka and her narrative voice. It had me enthralled from start to finish and is a novel I can definitely see myself rereading in the future.